Prominent & Leading Exporter from Pune, we offer paddle mixer and nauta mixer. Our company manufactures and supplies a comprehensive range of Paddle Mixer that is available with heavy-duty gearbox as well as motor. These products are available with customized facilities as per the client’s given specifications. Our products are used for lift, scoop and tumble materials and we manufacture these products with high-quality standards. We offer these products in a cost effective manner and these are easily available in the market in paddle designs. These mixers are features with twin shaft along with adjustable paddle pitch that enables the mixing degree as well as capacity variation. Our products are highly suitable for the lumpy materials including high moisture materials, filter cakes, and others. These mixers are widely accepted to provide high rote mixing and we offer these products with advanced technological development to the clients. Our products are available with gentle scooping action Paddle style agitators in the market and provide an easy way to clean the batches. We offer them with two parallel drums along with counter rotating shafts. These products are also used for conveying the materials and we offer them at most competitive prices to the clients. Due to their trouble free operations, these products are highly demanded in national as well as international market. Backed by sound infrastructure, we manufacture and supply a competitive range of Nauta Mixers, which are designed in compliance with the global quality standards. 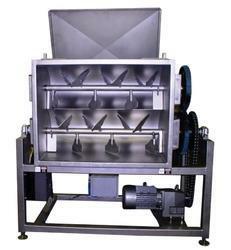 These products are used for mixing the products with high accuracy and efficiency. Our products are available in different specifications and are featured with Vertical batch mixer. 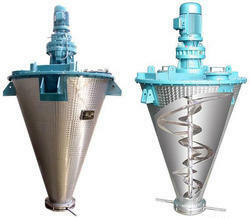 Further, these products provide dry mixing in a quick and reliable manner to our valuable clients. Our products are used to mix the dry materials, lotions, creams as well as paste. In this, mixer, the blending principle in based on differential travel product particles speeds in the conical vessel section. These mixers are available at less operating costs in the market and used in different industries. We offer these products with customized facilities as per the client’s provided specifications. Our mixers are available with unique tri blending action and provide a short time of mixing. Available with vacuum heating and cooling, these products have complete discharge. This is ideal for high viscous products such as Toothpaste, Chocolates, and Shampoos. Our products are available with low rotation speed as well as low power drive in the market and we manufacture these products with high standards of quality. Further, these are available with easy liquid addition and simple structure to the clients.